Pen and black ink and wash, green ink wash, red colored pencil, and orange watercolor pencil, on laid paper. Peggy Guggenheim, Venice; private collection; Bob P. Haboldt & Co., New York; Eugene V. and Clare E. Thaw, New York. 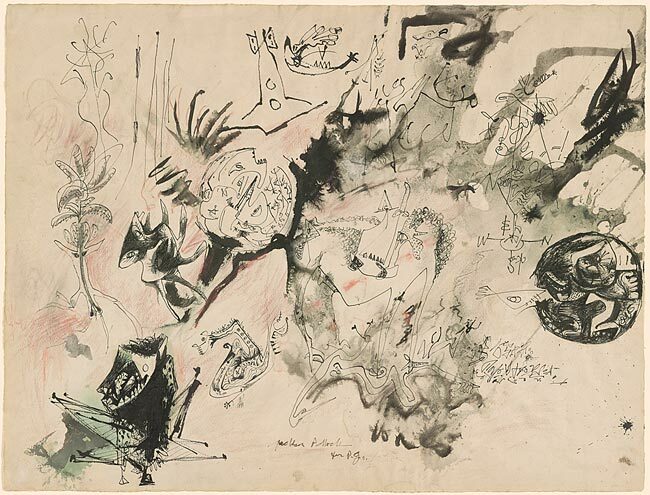 An important example of the fusion of primitivism and modernism that characterized Pollock's art in the first half of the 1940s, this drawing reveals the wide range of his sources, from the mask-like figures, mythic animals, and pictographs of primitive art to the imagery and style of Joan Miró, Paul Klee, and Picasso. This sheet is dedicated to Peggy Guggenheim, who played a vital role in fostering Pollock's career. It was included in his first solo exhibition at her New York gallery, Art of This Century, in November 1943.